Shaquille O'Neal needs no introduction. As the modern big man, nearly everyone knows Shaq and that extends beyond basketball fans and collectors. 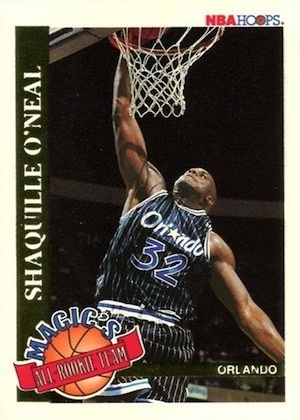 Although quite affordable now, the many Shaquille O'Neal rookie card releases were once part of a great chase and remain a popular option for collectors. 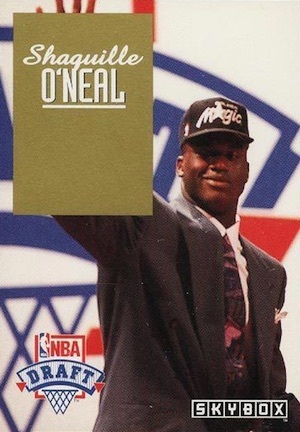 Drafted by the Orlando Magic out of LSU with the first overall pick in the 1992 NBA Draft, O'Neal eventually played for a total of six teams in his 19-year career. However, he is most remembered for his time with the Magic, Los Angeles Lakers and Miami Heat. O'Neal won three of his four titles and all three Finals MVPs with the Lakers. Shop for Shaquille O'Neal rookie cards on eBay. 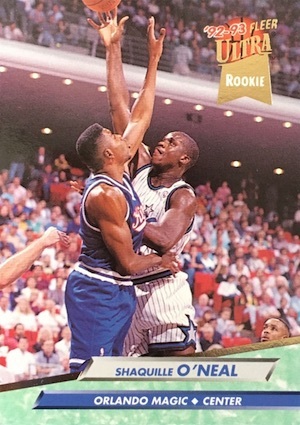 A bonafide star even before he played a game in the NBA, Shaq was arguably the first real example of rookie hoopla for basketball collectors in real-time but David Robinson could also make a claim. O'Neal's early cards sold for big sums and everyone was hoping to pull one. This demand was further compounded as Classic—a 1990s prospect brand—snagged an exclusive that delayed competing producers from issuing his cards. Because of this, many brands included redemptions in their Series 1 releases hoping to tap into the excitement. 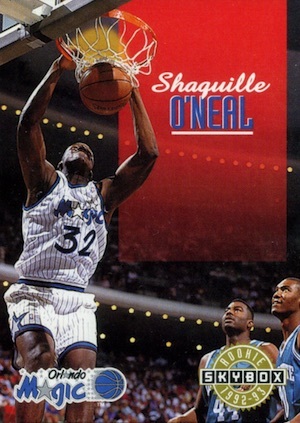 The official Shaquille O'Neal rookie cards finally arrived in the 1992-93 products that released later in the season. It is important to note that his rookies are exclusively found in the Series 2 (High Series) boxes for each brand. Part of the junk wax era of collecting, all are available in large numbers. Collectors can find a total of seven cards that meet the rookie designation. 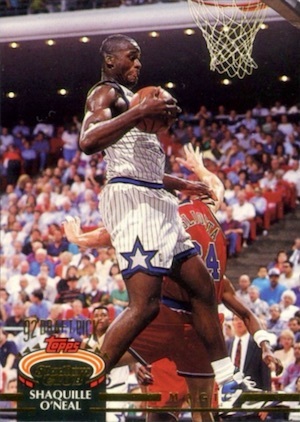 However, other early cards, including some of the most valuable 1992-93 cards for Shaq, still remain notable. 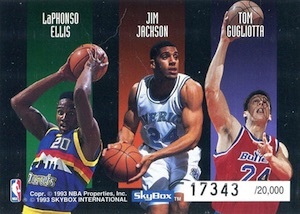 These various options, including his Beam Team insert, are documented below the official rookie card guide. 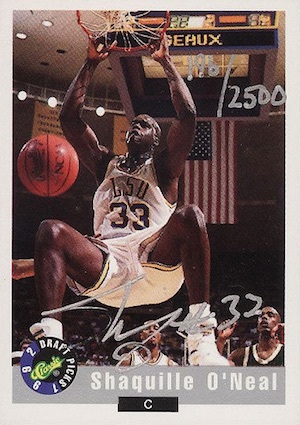 For more of his noteworthy cardboard options, view our guide to the top Shaquille O'Neal cards. Click on the images listings to shop for cards on eBay. Found in 1992-93 Fleer Series 2 boxes, this is actually the only Shaq rookie to showcase the "Diesel" in his black Orlando Magic uniform. Unfortunately, most of his rookie cards feature a very dated look and Fleer is no different. The gold border and large blue and gray banner dominates the card. 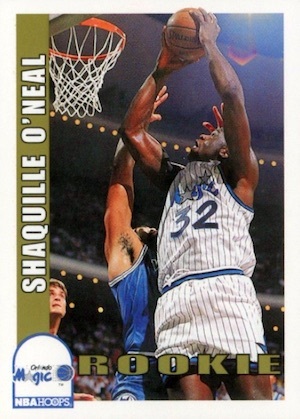 There is also a Slam Dunk subset card for O'Neal (#298) found in the same release. Some collectors may come across a similar card that carries #37 instead of #401. This is the Drake's promo version originally issued in bakery items. Opting for a more simple look, collectors will again need to locate Series 2 boxes to obtain the 92-93 Hoops rookie for O'Neal. It's not the worst design and is the first of several to highlight a pre-dunk image for Shaq. Hoops, like many other products, features several insert options for O'Neal that outrank his RC for many collectors and those are covered below. Featuring one of the crisper photos and a dunk, 1992-93 Skybox is actually one of the better Shaq rookie designs. This is not a great thing. The real star of the card appears to be the large red banner that occupies over a third of design. This is even more apparent given that O'Neal is aligned to the left of the card instead of the center. While it is largely synonymous with quality images, the 1992-93 Stadium Club rookie for Shaquille O'Neal actually features the most bizarre image on the list. In the air while holding the ball low with both hands, Shaq seems more concerned with getting that last bit of Gatorade off his lip than finishing the dunk. All kidding aside, the basic Stadium Club rookie is solid, but collectors are most interested in the Beam Team insert. In addition to the base and inserts for Shaq, there is also a Members Only parallel exclusive to Topps that was issued as a stamped factory set. Featuring all 400 base cards and the Beam Team insert, the full print run totals 10,000 sets. Heavy gold foil and a large white border screams 1990s Topps but the 1992-93 Topps rookie does offer one of the better images of O'Neal. While most shown on this list present an image taken at some point during a dunk or feature him looking away from the camera, the Topps Shaquille O'Neal rookie card showcases a clean look at "The Big Aristotle." 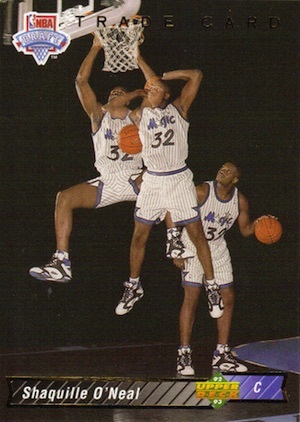 One of several full-bleed designs, Ultra stands out amongst Shaq rookies based on the marble nameplate at the bottom. Featuring another awkward face for O'Neal, this card is the most eye-catching thanks to the green-ish color. All-Rookies and Rejectors inserts for O'Neal are also popular with collectors. The most unique rookie for Shaquille O'Neal is also the most rare. However, this is early 1990s "rare" which means there are still a ton out there. Featuring a progression image of Shaq dunking, the card comes in two forms. This main rookie (#1 NBA DRAFT PICK) was issued in Series 2 packs but is still card #1. In addition, a Trade Upper Deck redemption came in the first series and is detailed below. There are also multiple subset cards for O'Neal that are not nearly as popular. The aforementioned Classic did not just issue base cards for O'Neal, but autographs as well. Available with hand-numbered print runs and found in a few products, collectors can locate several signed versions. The first of two notable inserts for O'Neal in Hoops, Magic's All-Rookie Team includes the ten best 1992-93 rookies according to Magic Johnson. Coming as no surprise, Shaq leads things off at the first spot. Found in Series 2 boxes, the All-Rookie Team cards are fairly rare and average 1:30 packs. 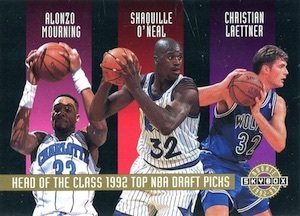 Part of a very tough redemption program in Hoops Series 1, ten top draft picks from 1992 were available as a set and O'Neal was included along with Alonzo Mourning and Robert Horry. A huge number by today's standards, the final print run is believed to be just under 26,000. 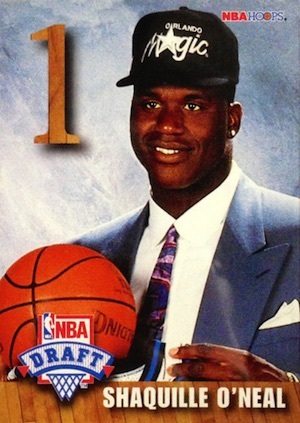 Still, this is one of the most valuable rookie-year cards for Shaq. Continuing the redemption trend, Skybox got in on the fun as well with this colorful draft image that was not too hard to pull via redemption at a reported 1:8 packs. I like to imagine the large gold name banner is there to censor O'Neal flipping the bird but I don't think this is actually the case, especially since you can see his fingers at the top. The other redemption from Skybox combines six rookies, including Shaq, on one card with the Head of the Class insert. Issued through a mail-in wrapper promotion, the cards are serial numbered to 20,000 copies. 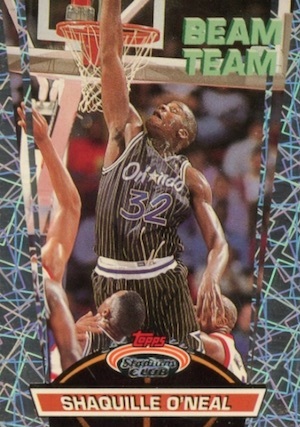 The true standout of the 1992-93 cards for Shaquille O'Neal, Beam Team is a name that still carries respect in the hobby to this day. 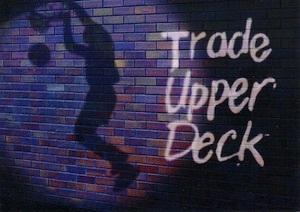 Designed around the NBA halftime light show, the popular insert includes Shaq as well Michael Jordan. 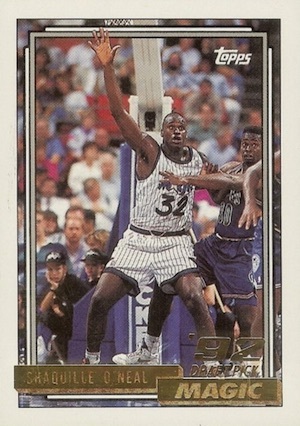 It is both the most popular and valuable among Shaq's earliest cards. 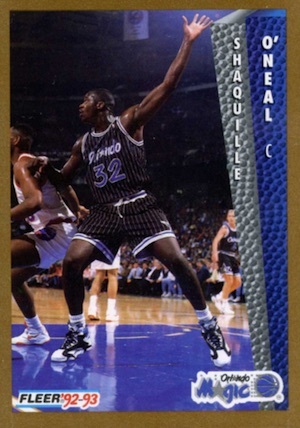 More of a variation than anything else, the Trade Upper Deck redemption in Series 1 was good for a special Shaquille O'Neal rookie card. The only difference between this and the pack-pulled card from Series 2 is the gold foil "Trade Card" headline at the top. 1992 Topps New Shaquille O'Neal ROOKIE #362 Basketball Card ! "RARE" Mint !! I have a Shaquille O’neal card from Fleer 92-93 with Shaq in a black uniform the number 37 not 401, and cannot find any info on it , or see it mentioned in your article. can you give me an idea what it’s worth? Hey Nick, that’s the 1992-93 Fleer Drake’s promo version that came in bakery items. Identical to the main Fleer edition except the card number. I have an authentic photo of Shack O’neal Rookie of Year 18 inch x24 inch .what’s the value? 1992-93 Hoops Shaquille O’Neal #442 RC Rookie, Graded PSA 10 Gem Mint!! !